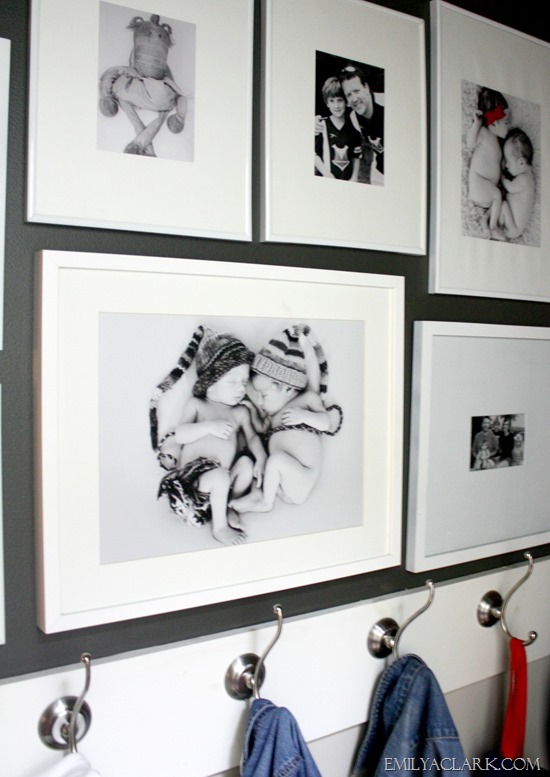 Can You Have Too Many Gallery Walls? I may be the wrong girl to ask since I’ve never met a gallery wall I didn’t like. But it is a good question—especially for houses with open concept floor plans. 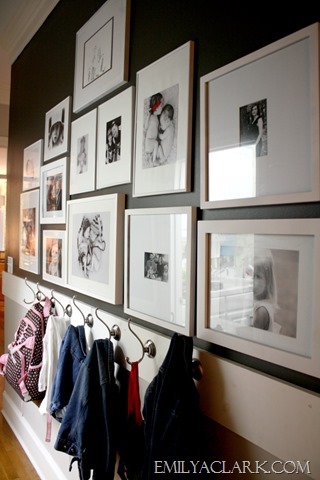 A big collection of frames is great for lots of reasons. 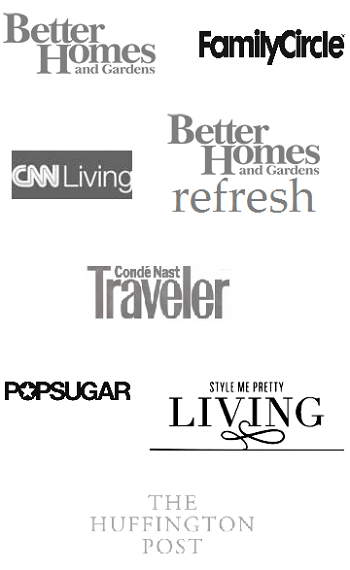 Mainly, because it’s an easy way to make a big visual impact—on almost any budget. But, what’s the trick to keeping your walls from looking cluttered? 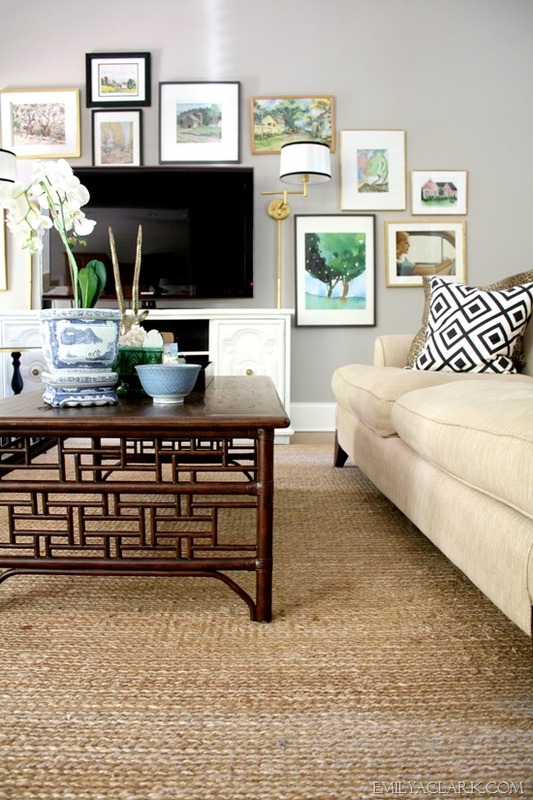 When rooms are open to one another—like our entry and living room, for example—I think you can still do more than one gallery wall. The trick is to make them feel and look completely different so they’re not competing with each other. I’ve grouped my gallery walls by “theme,” by the frame type and by varying the arrangement on the wall. 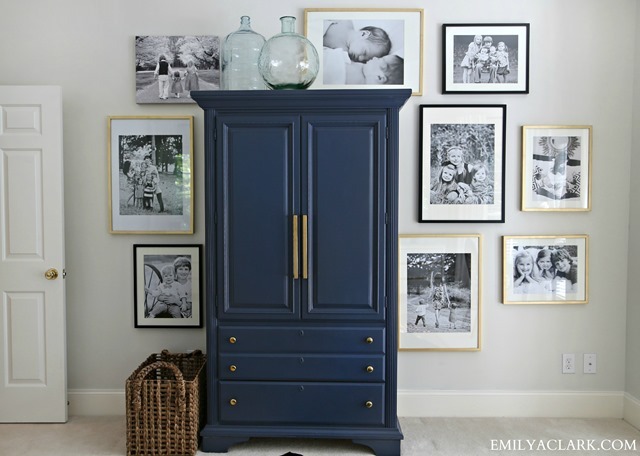 Gallery wall arrangements are also my favorite way to display family photos. I can actually see and enjoy my photos every day that way—and there’s only so many small picture frames you can have sitting around. It doesn’t bother me to have lots of these collections throughout the house because I feel like they tell our story—and they just make me happy. 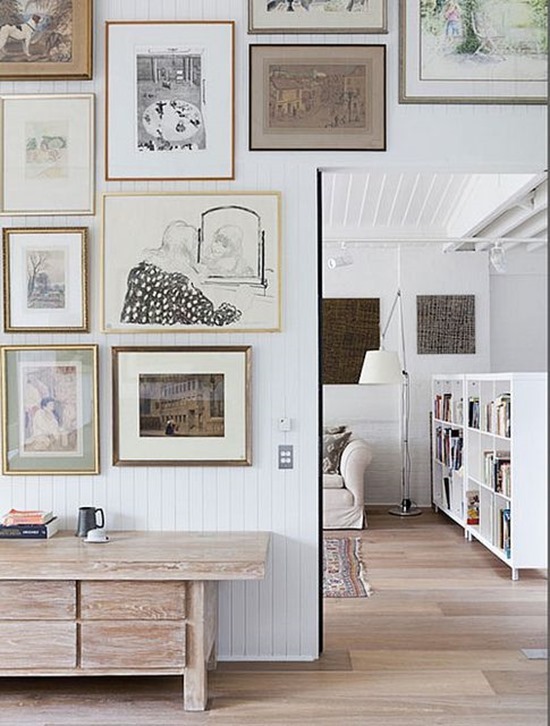 What are your thoughts on how many gallery walls you can have? i have several as well, and i don’t think you can have too many as long as they aren’t contrived and truly made up of things you love and tell about you and your family! I’m with you – as long as they each have their own look, I don’t think you can have too many gallery walls. Oh yours are all so beautiful, I think you have done it right. 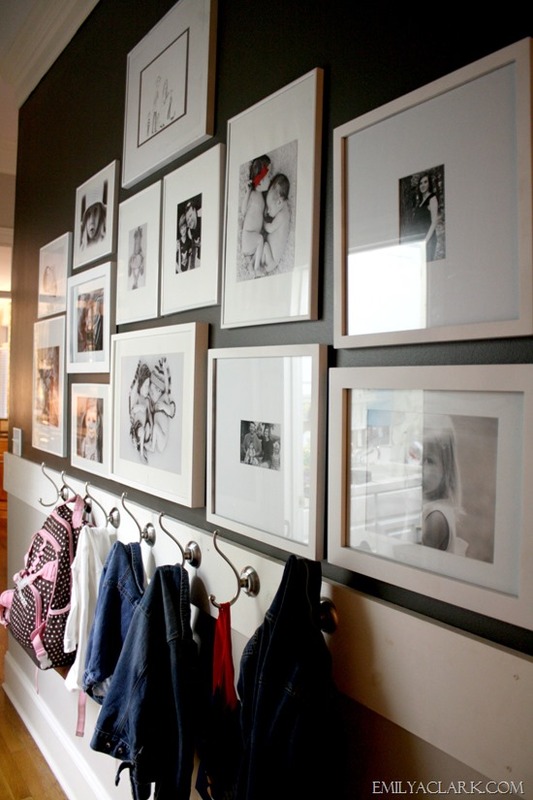 I agree with you of course….there is nothing prettier than a well curated gallery wall…..
Love your tips! I think you’re totally right. And it comes down to personal taste… Too many frames in one room might overwhelm some but be the perfect inspiration for others…. I’m with you Emily! Gallery walls are fab! 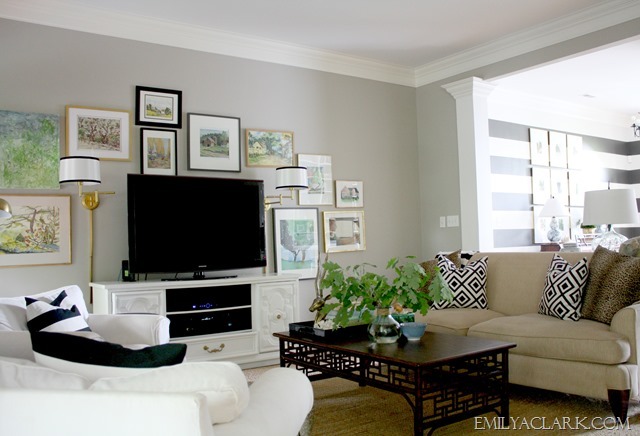 I LOVE gallery walls and planned to have one in our new home…but what I LOVE even more is the grey paint in your livingroom…can you share the name of the color, please??? Thanks, Cheryl! It’s Amazing Gray by SW.
Well, your house is one of my favorites so at least I’m in good company! I think I asked this question, too! I have three, but need more to support by photo and art habit. I hope there’s no such thing as too many if they are done nicely. sorry if this is already answered in another place but what is the wall color in the mudroom/coat hook area? thanks and i love your house and your style! Do you have any recommendations on your favorite places to purchase frames for a gallery? I’m specifically referring to photography of family :)) We have lots of professional photography and I LOVE the photos, but can never seem to find the right frames :) Thank you! Your house is gorgeous! I just posted tips on gallery walls the other day…I wish I had linked to this post because yours are perfect! When we moved into our new home I wasn’t quite sure how to handle a 19′ x5′ foyer hall running from the front door to the Great Room. I thought I’d hate it1 But, I decided to hang all the large art pieces that my Granddaughter had done for us over the last few years. It worked and is a wonderful “Gallery Hall” showcasing my Granddaughter’s work! I love gallery walls too! I have one in our house now, but I’ve been contemplating adding another! I am so glad you have so many gallery walls. I have thought this as well before but it has never kept me from not keeping mine up! 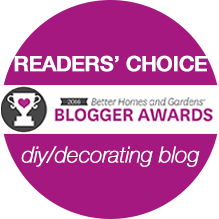 Like you said, they make decorating manageable on a budget and are also so easy to change out. I hope they never get old! 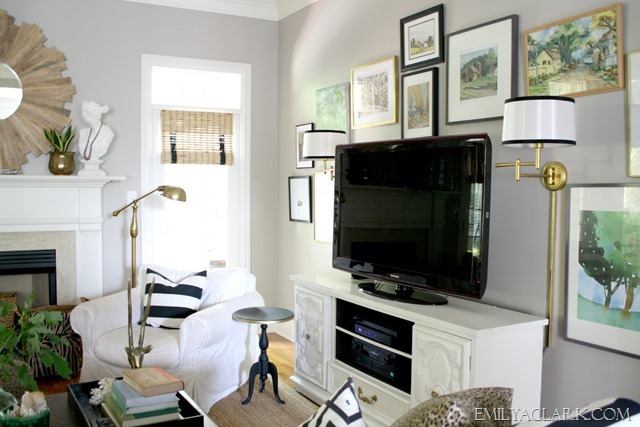 Your TV gallery wall has always been my favorite! I think every time you show a new photo of it I have to pin it. It is just so beautiful every tme…and I am realizing now that it is the cohesiveness in the watercolors that make it work so well! Such a great thing for me to remember when putting a wall together! I’m also of the camp that you can’t have too many gallery walls. Thanks for sharing your tips and thoughts though. The beauty of gallery walls is that they appear organic but in actuality, the most thoughtful and successful ones have a good bit of thought behind them. I was hoping your answer would be No, because I have a gallery wall in a few rooms! I love them, because it allows me to showcase several pieces of art or photographs without having to make hard choices of what to exclude, and I also don’t have to spend a huge chunk of money on a single large piece of original art. I think you said it perfectly! I’m a huge fan of gallery walls! I really love that you not only mix large and small, dark and light frames, but that you throw in a canvas or two! Being a photographer and a military family we move all the time. We just moved from Kansas to Miami and downsized by 2000 square feet! I could part with furniture, but not photos and artwork. This is perfect for my few small walls and TONS of photos! Thank you for the inspsiration! Great post! I LOVE gallery walls and worrying about overdoing it. (I’m kind of an art hoarder and come from a family of artists so I have a lot of their artwork!) I just try and balance out the weight from one side of the room to another–gallery wall on one side, large furniture of the other, etc. Thank you for the great tips! I just want to know how you keep all those pics straight!!! Mine are all over the place almost every day. Loved your post on Gallery Walls. 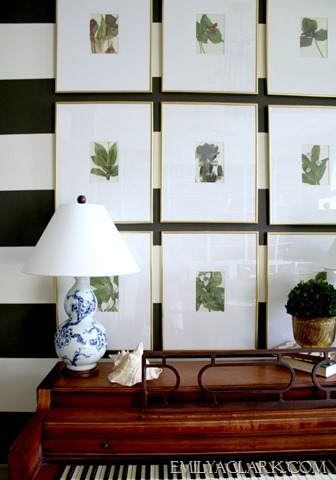 Just curious…….where did you find the botanical prints you have in your foyer. Also, do you have any websites that you would recommend as a DIY project for creating botanical prints? Thanks! My botanical prints came from an old book called Wildflowers of America. (I think there are newer versions on Amazon…). Thanks Emily! I did remember you having a recent post about a botanical DIY project. So glad you shared it again! 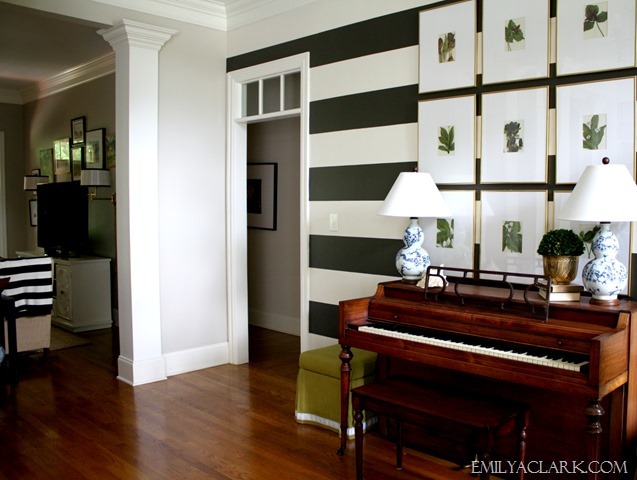 Emily, I love your style and have followed your blog for a couple of years now. You always have the best tips! I have two very large walls in my living room and really no other space in the main house to hang pictures. I did a gallery wall behind our couch which faces an even bigger wall where the TV is on. I want to also frame the TV wall like you’ve done. Do you think that would be too much? Thanks, Mary! If I were doing two gallery walls in the same room, I would probably mix them up–doing one on a grid and the other a little more haphazard so that they don’t look like they’re competing against each other. That’s what I was thinking too :). Thanks Emily! Where did you get your black and gold gallery frames? I love the master wall. I was also wondering where you found those gold frames that hang on the striped wall. I have been looking for some just like them. Any help would be greatly appreciated! Hi Alicia, They’re the inexpensive plastic frames from Michaels, spray painted gold. I have two open walls in my living room and they are across from each other and relatively long, i also live in an apartment. How would it look if i made them both gallery walls? The other wall has the patio and blinds on. I have spent many months contemplating it, and i am just ready to have it decorated. If it would look to clutttered, what else could i do to those walls? Thanks! I have a living room and kitchen that are open to each other. In my living room I have a gallery wall and in the space that separates the kitchen from the living room I added ledge shelves that I made for another gallery wall so that I could change the photos and art easily. While the walls are occupying the same space I love how they turned out and I get lots of compliments. To keep the ledge shelves from being too busy I painted them to match the walls. I noticed you never did more than one gallery per room. What did you do on the wall opposite to the wall gallery with your tv? My living room’s two best options for a gallery, happen to across the room from each other. What is your recommendation for choosing the best out of the two?